Race Ready Performance Dual Electric Exhaust Cutouts - FREE SHIPPING! Open & close your vehicle’s exhaust system for more horsepower & better sound. All done electronically from inside your vehicle with the push of a button! Choose from 2.5", 3", 3.5", 4" or 5" - From $399 + FREE SHIPPING! Housing is manufactured from 6061-T6 billet aluminum and machined down to .600" thick to ensure flatness. "Bull Nose" butterfly seals in matching "Bull Nose" seat. These electric exhaust cutouts are manufactured to the highest quality standards with only the highest quality materials. 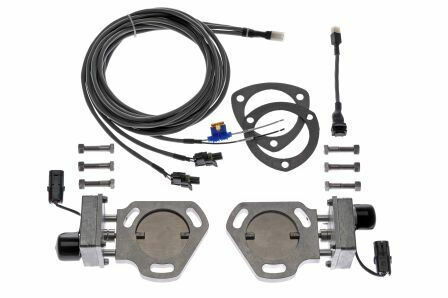 Inexpensive, bolt-on horsepower that's easy to install - fits virtually any make or model vehicle, and adds that special touch that'll set your custom show-car or hot-rod apart from the rest of the crowd. 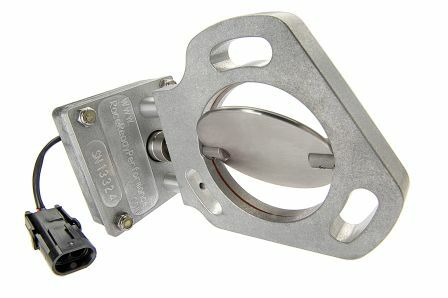 Race Ready Performance Electric Exhaust Cutouts are available for 2 1/2" thru 5" exhaust systems. The kits are available in single and dual exhaust versions.